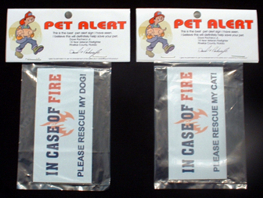 This Pet Alert© sign is one of the newest pet safety products designed to be used in case of an emergency. In our quest to bring you a green and healthy home, we cannot forget our beloved pets. I have friends who are firefighters and rescue workers. One of their biggest complaints is that they have no way to know if a house has a pet inside. 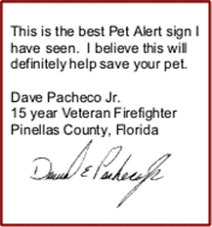 Pet Alert© is designed to be displayed on the front door of a home. My firefighter friends have said that when they enter a home during a fire, they almost always go through the front door, and if one of these signs is on that door, they will look for a cat or dog, otherwise, they only look for people. One of the reasons why so many dogs and cats were lost during hurricane Katrina is because rescue workers did not know that there was a dog or cat in the house. Pet Alert© is 2in X 4in aluminum plate with a white background. It comes with double backed tape for easy mounting to most surfaces. *Note clean area with oil free cleaner (mild soap and water)and rinse thoroughly before mounting. Pet Alert© is one pet safety solution that doesn't cost much, but is invaluable to the safety of your pet. If you are interested in Wholesale pricing, please fill out the form below or use this add to cart button.